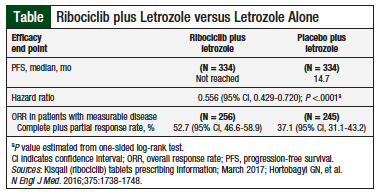 At the interim analysis, PFS was not reached with ribociclib plus letrozole versus 14.7 months with placebo plus letrozole (Table).7,9 PFS and overall response rate results were consistent across patient subgroups. The most common events leading to treatment discontinuation were increased alanine aminotransferase (4%) or aspartate aminotransferase (3%), and vomiting (2%). Common adverse events (frequency ≥20%) were neutropenia, nausea, fatigue, diarrhea, leukopenia, alopecia, vomiting, constipation, headache, and back pain. Ribociclib is the second CDK4/CDK6 inhibitor to receive FDA approval. In the clinical trial that led to its approval by the FDA, adding ribociclib to letrozole significantly extended the PFS duration and improved the overall response rate in women with HR-positive, HER2-­negative advanced breast cancer. National Cancer Institute SEER program. Cancer stat facts: female breast cancer. http://seer.cancer.gov/statfacts/html/breast.html. Accessed June 15, 2017. American Cancer Society. Hormone therapy for breast cancer. Revised August 18, 2016. www.cancer.org/cancer/breastcancer/detailedguide/breast-cancer-treating-hormone-therapy. Accessed June 15, 2017. Inman S. Three experts examine the ER-positive treatment landscape. OncLive. February 26, 2015. www.onclive.com/conference-coverage/mbcc-2015/three-experts-examine-the-er-positive-treatment-landscape. Accessed June 23, 2017. US Food and Drug Administration. FDA approves Ibrance for postmenopausal women with advanced breast cancer. Press release. February 3, 2015. www.fda.gov/newsevents/newsroom/pressannouncements/ucm432871.htm. Accessed June 23, 2017. Ibrance (palbociclib) capsules [prescribing information]. New York, NY: Pfizer; March 2017. US Food and Drug Administration. Ribociclib (Kisqali). March 13, 2017. www.fda.gov/drugs/informationondrugs/approveddrugs/ucm546438.htm. Accessed June 15, 2017. Toich L. Kisqali Femara co-packaging approved for breast cancer treatment. Pharmacy Times. May 9, 2017. www.pharmacytimes.com/news/kisqali-femara-copackaging-approved-for-breast-cancer-treatment. Accessed June 23, 2017. Hortobagyi GN, Stemmer SM, Burris HA, et al. Ribociclib as first-line therapy for HR-positive, advanced breast cancer. N Engl J Med. 2016;375:1738-1748.